« Patriotic Duty To Raise Chickens! Top Bar Barrel Bee Hive Chicken Coops! It seems this page has been picked up on several other websites. 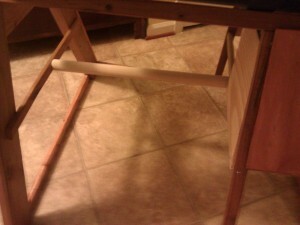 Some people have had questions and concerns about the purpose and use of this setup. This setup was planned for use in a small backyard when we lived in a townhouse. The intention never was to have the chickens confined under the beehive. It was a “coop”, like any other coop they go there to lay and to sleep. The front is a large door that would be left open during the day, during which time the chickens would be free-ranging in the garden. We used these in this setup for a few months before moving to our current home on 11+ acres. When we did use this setup we had none of the problems any of the “experts” are claiming we would have endured. The chickens did not ever get stung and the bees were never irritated by the chickens. You can read about having chickens and bees in close proximity on this post. The hens were very happy going into the coop area. Since the area was so small, it was very easy to keep clean by removing manure and having fresh shavings put down. 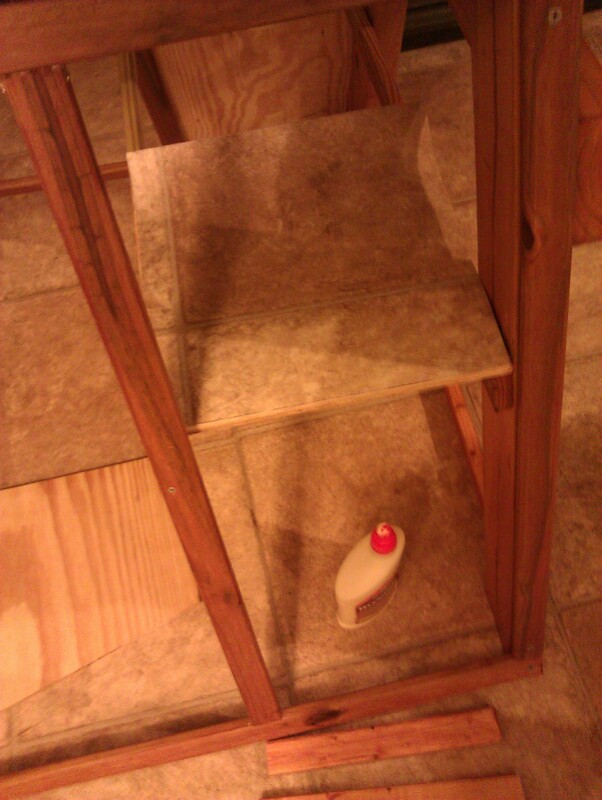 There was never an issue with dust of any kind going near the honey. So if you are space confined and want to make the most use of what you have, then this setup is an excellent option! We now have a very different setup due to having much more land to utilize, but still have our hives in our chicken run. You can read about that from our main egg page or our Chicken category! 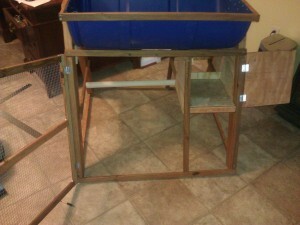 A bee hive chicken coop?! You probably think I’m joking, right? If you recall our last post about the benefits of raising chickens, we were inspired by the idea of chicken tractors. Since we didn’t want to give up any more yard space from our gardening, we already had these wonderful top bar barrel bee hives built, and the space under the hives was about the same area as some of the chicken tractors we’d seen, that they’d make a perfect area for our own chickens. We spent some time searching online to see if anyone had ever had problems keeping chickens and bees in close proximity. While we could not find anything in the proximity we were wanting, we did not find anything that suggested there would be a problem. We attended our local beekeeping club and talked to several people who had bees and chickens, explained our idea, and received skeptical but positive responses. With this lack of show stoppers we decided to press forward, worse case we could always sell or give away our chicks to some of our new friends from the beekeeping club! Unlike the hives, we could not find any plans or pictures online of a top bar barrel bee hive chicken coop (TBHCC). 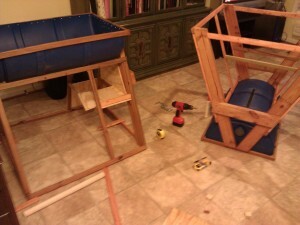 So for this project we were completely on our own to come up with plans and execute the assembly. We looked at lots of different chicken tractor designs and full coops online to get some inspiration and decided to settle on a basic mini coop design. Our goal was to have an area large enough for two to three hens with a single brood box for the active layer and a full length roost that all two or three hens could sit on. We also wanted to have a large opening so that we could easily clean out the coop and extract the manure to go into our compost pile and/or garden. 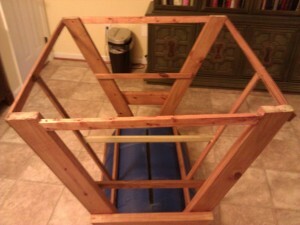 To start out we built out a frame around the base of the hives. The reason for this was to have a level frame, have attachment points for the main door and brood box door, and have a secure base to keep creatures that would bother the chickens out. For the brood box we wanted to have it just big enough for the chickens to lay their eggs but not too large that they would get comfortable and sleep in there. Some websites we read said a 12x12x9 (inches) area was optimal so the chickens would lay their eggs but not sit in there too long. So we divided the frame with another 1×2 piece on each side. We had some extra flooring laying around so decided to give the base of the brood box some additional covering to aid in cleaning. Just used some staples from the staple gun to attach it. If it gets too dirty and does not work out we can easily rip it out and replace it or do something else with it. To give the hens a little more protection from the elements we decided to put a cover on all sides of the hive/coop except for a section on the inside allow the hens to jump in and out of the box. We also added a little lip on the brood boxes so that the nesting material we would add would stay in and help keep the eggs from rolling out. 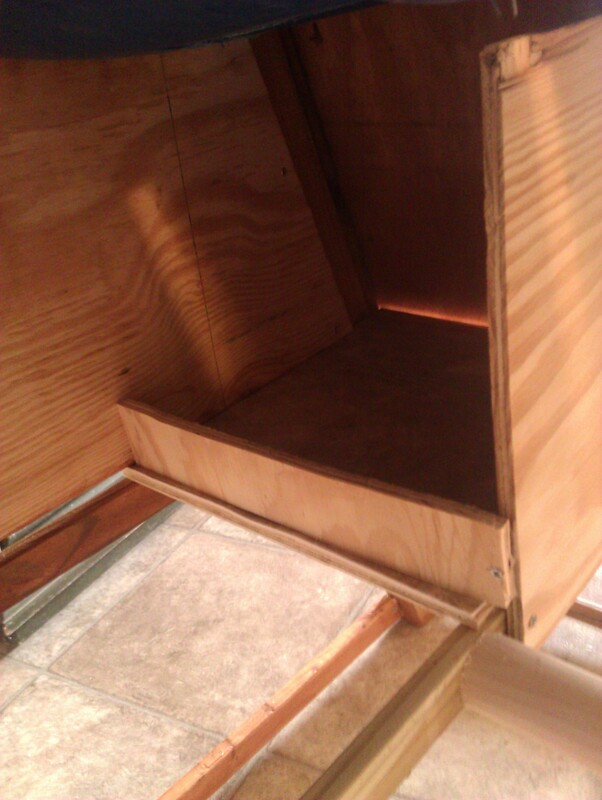 The roost we created from a dowel that we attached to the divider support and side cross piece. We attached the doors using some basic hinges and locking eye-hooks. The doors open away from each other with both locks on the middle divider. You can see that the main door covers the entire height of the coop area so we maximize our access for maintenance. 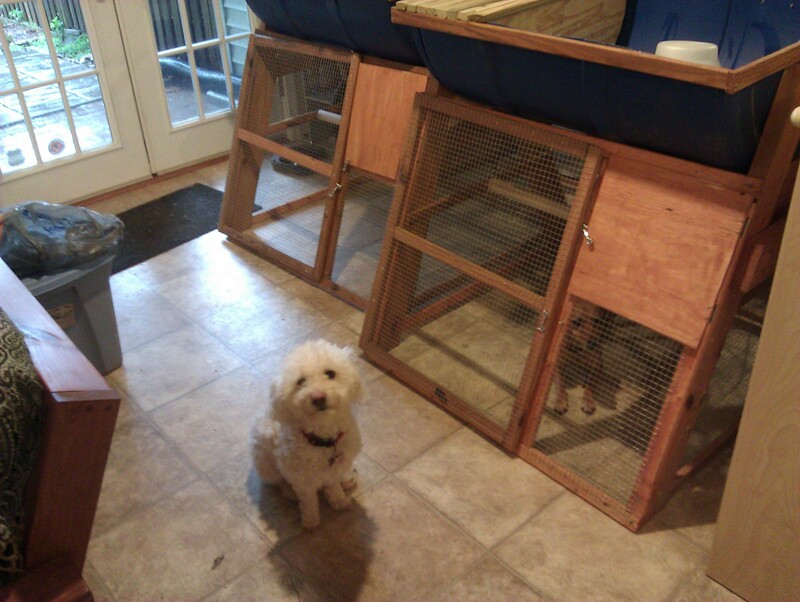 Dogs Like The New Coops! 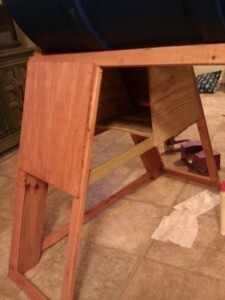 The last step was to staple the remaining hardware cloth to the rest of the hives. We did a final checkout with our two dogs just to make sure it was a good home that our future chickens would like :)! What do you think about our design? I have lots more pictures so if you have any questions or would like to see more please post a comment! How has this been working out for you so far? Any problems with the birds and thd bees so close? 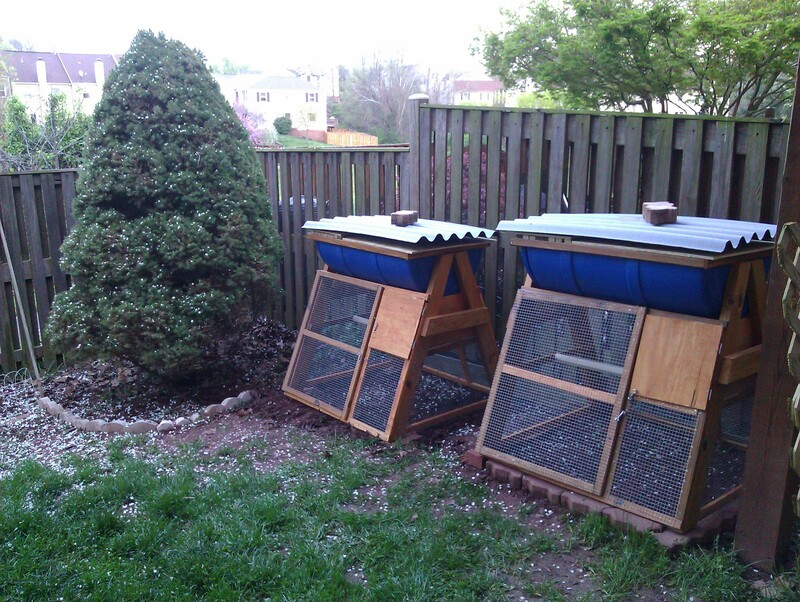 We had to get rid of the chickens from our original setup due to HOA issues. However, we’ve since moved to some acreage and you can see our new coop setup we do have the beehives in the chicken run so the hens are right with the bees all the time. It works really well because they eat the pests that would attack the beehives. 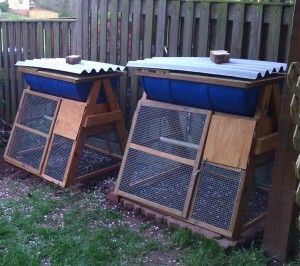 We are not using these currently, our flock is too large and we built a full chicken coop to house the birds. The beehive portions are still in use, and they’re situated in our chicken yard so chickens are around them all the time. There haven’t been any problems with the birds and bees being close. The bees seem to be high enough that the birds don’t notice them. Very nice set up. We have a top bar hive and a coop with 8 hens and a guinea. They all live peacefully in our backyard. To bad the HOA nazis got after you. Sounds like they forced you into a much better situation anyway! I like the new setup! Do you have any problems with the girls trying to roost on the hives? i love this idea,its the best I’ve ever seen,thanks guys for your brilliant idea.i have a barral bee hive too,but didn’t think of making it into a chook pen lol. I can see using this setup for a few months with no problems. You might never have any problems, but the risk for disaster is there. If you take in to account the possibility of new beekeepers trying this and combine that with areas where there are Africanized honey bees… I witnessed an Africanized colony attack and kill 4/5 chickens in someone’s yard. The hive was not actively managed and became very aggressive. If your yard is small, it’s a much better solution to put the hives on the roof where they will be out of the way. I agree chickens and bees can live in harmony, but this setup getting shared on pintrest by people who don’t know what they are doing (yet) scares me. If the homesteading community censored every idea because someone or something could get hurt if it was done the wrong way or a number of rare combinations culminated at the same time, then there would be nothing to post about! Not a lot of people live in homes where the roof is accessible, flat, or safe to access. This is a legitimate and good option for people who are space limited but want to do all they can to help the bee populations and enjoy fresh eggs in a small space. Our current setup does not involve these exact hives, but we still have our hives in with 40+ chickens that roam around the hives daily and for 2+ years have had no issues with the chickens and bees interacting. In fact, we have enjoyed hives virtually free of pests. I love this idea. I have had bees around my bees for years without problems. I love new ideas and trying new experiments. I think all beekeepers especially in africanized bee areas need to have a plan if things go wrong.